Doesn’t a good pizza bagel just make your day?!?! It’s warm and gooey with a chewy, salty, dense bagel underneath! What’s not to love?! Side note: I always choose a salt or everything bagel for my pizza bagels, but my sister says this is “gross” and that one should only get a pizza bagel on a plain bagel. You decide. Did you know that originally bagels came in only plain or salt? Then they started branching out into all sorts of other flavors in the 1950s. And with the rise of Lender’s – prepackaged and frozen bagels – so too more flavors and more diverse consumers across America, for instance, the cinnamon raisin bagel, which was created to appeal to the non-Jewish “breakfast food” market. I just got done reading Maria Balinska’s The Bagel: The Surprising History of a Modest Bread which is a fascinating look at the creation and rise in popularity of the bagel. Bagels have a fuzzy origin story, in that many ethnicities and countries have similarly shaped bread products so it’s hard to pinpoint one beginning point for the bread with a hole phenomenon. But it’s also a food whose history is intertwined with stories of political, economic and labor battles. The book is a quick read for anyone interested in food history and/or Jewish food history. But anyway, back to the pizza bagel at hand. This particular pizza bagel was procured at New York Coffee Shop, a crowded Jewish bagel and coffee joint in the Braeburn neighborhood of Houston Texas. “Decorated” in the 1980s, walking in reminded me of the formica counter top diners we would go to as children, perhaps after Hebrew school on Sunday for a matzah ball soup and pickles. My mom did indeed have the matzah ball soup which looked traditionally delicious. And I of course had the pizza bagel, on an everything bagel, with a cup of coffee. It was all really good. The coffee was above average and totally came in above expectation. They definitely knew how to do a good pizza bagel with toasted bagel, fully melted cheese and not too much sauce. Personally, I don’t see how one could mess up a pizza bagel, but you’d be surprised. If I had it to do over, I’d choose a salt bagel just to kick things up a notch. And the personality of the place was charming and nostalgic too. Would I want to lick the table? No. Did we run into people our in-laws knew from the community? Yes. And isn’t that really what these old-school Jewish diners are all about in the end? Thumbs up. A few weeks ago, my mom, aunt and I went to visit my sister in Houston to work on some of her wedding to-dos (um, yes, cake tasting). 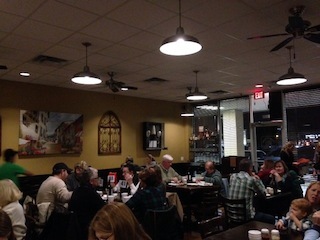 Craving some pizza (obviously), I searched online for Houston’s best pizza, and while many came up, we chose Pizaro’s Pizza Napoletana (http://www.pizarospizza.com/), for the sheet fact that we would be driving out towards the burbs rather than into the city on a Saturday night. 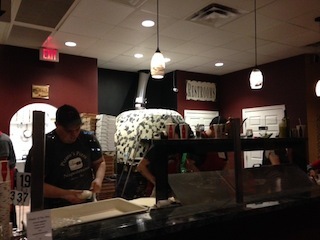 It’s a wood-fired brick oven fast casual concept, where you stand in line to order, pay and take a number. And very quickly afterwards (the pizzas only take 90 seconds to cook in a 900 degree oven), your piping hot pizza arrives at the table! BYOB. The oven is that mosaic dome in the back. It was made in Naples and shipped to the US, according to their website. The guy up front is making dough. 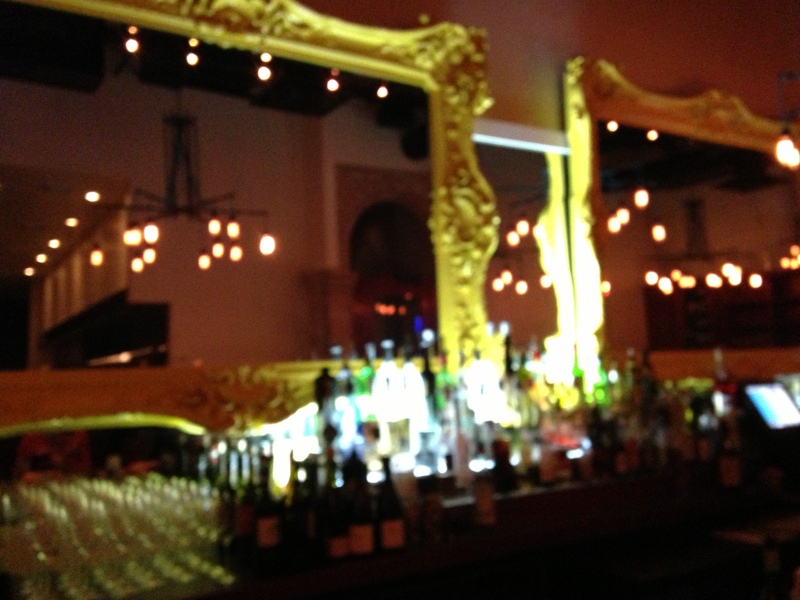 The interior – not anything spesh, very crowded, very kid friendly. 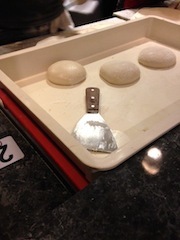 The dough rounds being prepped for pizza! Okay, let’s start with the negatives. 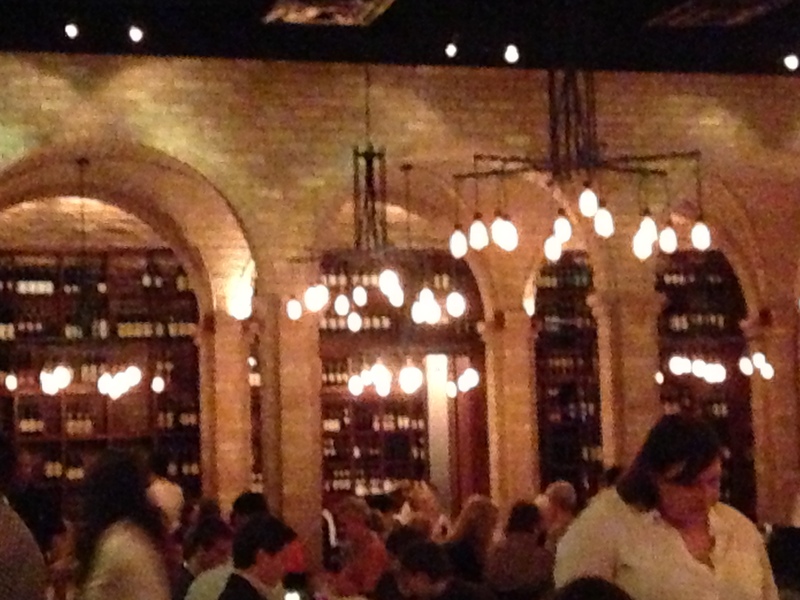 It was crowded (a given on a Saturday night in the city that is known for eating out). It was cold – since we couldn’t be picky about where we sat, we grabbed the only available table, which happened to be right underneath a very blowy AC unit. Brr. We scarfed that pizza down – it was cold by the last slice. 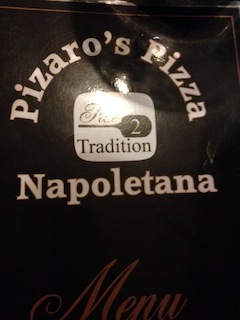 The good news: the pizza was really tasty!! Crust that wasn’t soggy and not burnt either – perfect chew, with a few good dough bubbles. (My sister claims I always wanted the slices with the bubbles growing up, but that was actually she.) 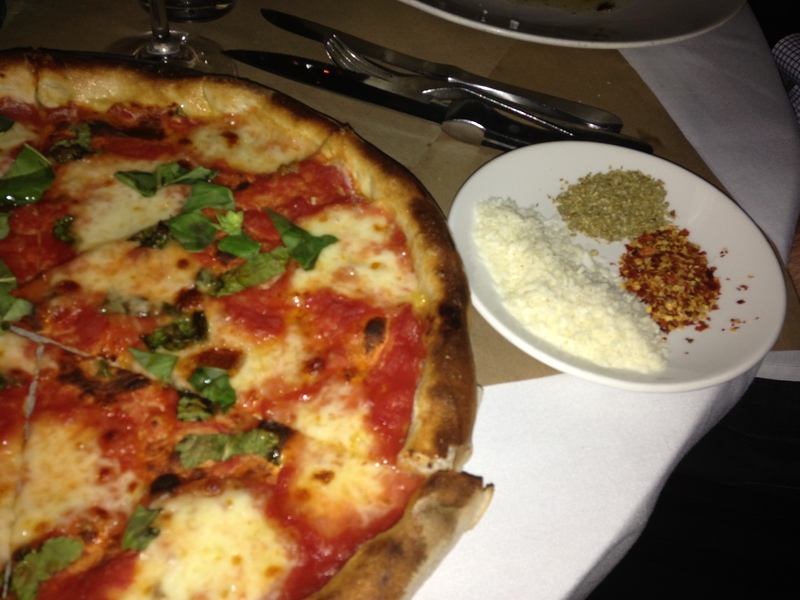 Fresh ingredients, and the perfect size for a personal pizza. 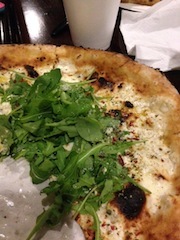 My sister and I split a classic cheese (always a good baseline) and an arugula and parmesan white pizza. Both were delish and we demolished most of them before my mom and aunt’s pizza even came out to the table. 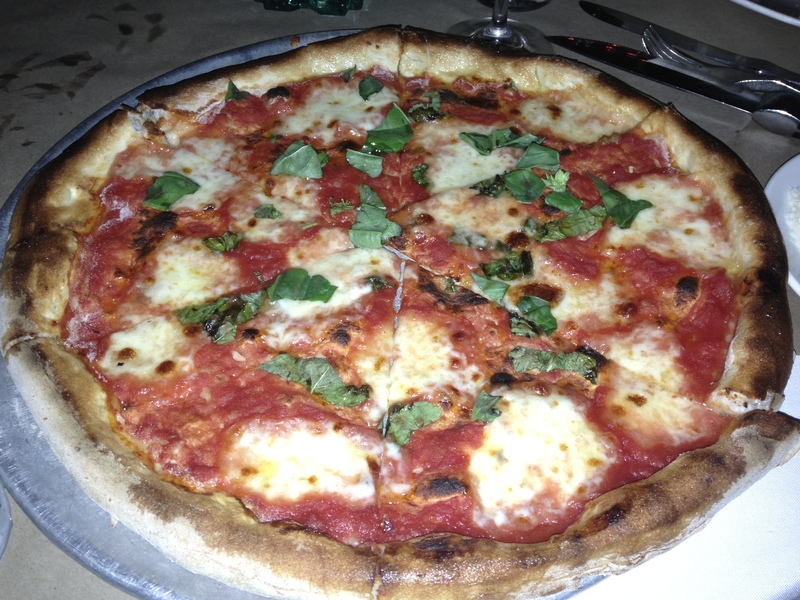 The cheese pizza was really more of a Margherita minus the basil. I was a bit put off by seeing the chef squeeze oozy mozzarella out of what looked to be a giant pastry tube, but it did seem to be quite fresh and milky and tasted like homemade mozzarella. 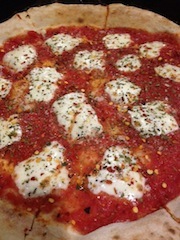 Definitely different than the dry pre-shredded part-skim bagged mozz I get at the store. All in all, a good choice; I would do carry-out next time though to avoid the shiver.